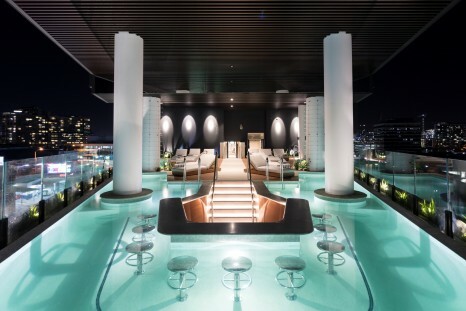 Check yourself into this hotel wrap complete with luxurious photos and incredible deals. And by check-in we mean read of course, you cannot sleep in this article. 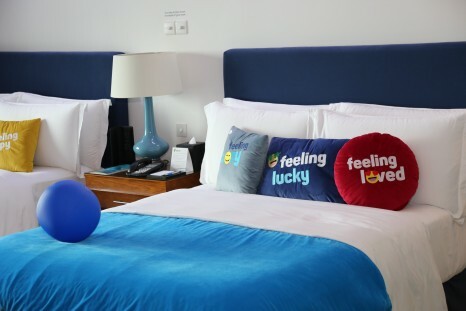 Holiday Inn Melbourne on Flinders has completed the refurbishment of all guest’s rooms, bathrooms and suites. 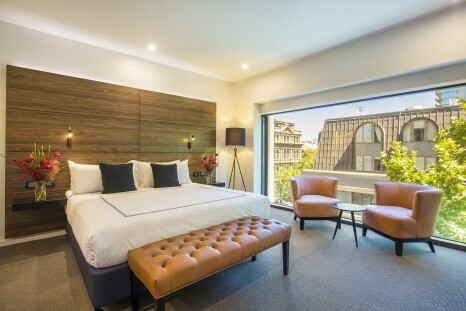 Hotel owner, Philip Carter enlisted architects Wilson & Hill of New Zealand, to completely strip out and reinvent each the hotel rooms plus adding seven more to bring the room count to 209. Each room was completely gutted to create a blank canvas for the architect to design a room with the modern traveller in mind. The bathroom, luggage rack and wardrobe have been purposely designed outside the bedroom, which allows the guests to have more of a living room feeling while relaxing on new Holiday Inn pillow top beds. Large HD TVs have been integrated into a stylish wall panel with HDMI and USB connectivity, which allows the traveller to connect with free WIFI to their favourite digital content. Travellers are also able to enjoy the floor to ceiling windows with electronically switched block out blinds which can be controlled by the bedside. The new bathrooms have also been completely gutted and now featuring large showers with no threshold and an opaque window into the bedroom which provides guests with natural light. The stone vanity counter tops offer plenty of space and all fittings are water conserving, ensuring that the hotel continues to minimise the impact on the environment through the IHG Green Engage system. In celebration of reaching one million Facebook fans, Atlantis, The Palm will reward followers with the launch of the world’s first social media suite. Launching on 18th March 2018 at the destination resort in Dubai, Facebook fans will be invited to book a free one night’s stay in the Atlantis Fan Suite with bookings being taken every day until December 2018. The unique room, will offer breathtaking views of The Palm Island and will be specially adapted to suit a social media users every desire. Upon check in, guests will enter their Facebook log in at the door of the suite to unlock the room and can sit back and tune into the special Facebook Fan channel on the in-room TV. For those that need a little help during their stay, guests can ‘poke’ their personal butler using a special in room intercom system. For those who want to share every moment of their stay with their friends and family, the suite comes with a special Facebook Live Lounge, where guests can place their handset on a stand and relax on the thumbs up shaped chair to record their messages. Exciting additions extend to the bathroom, where a social media mirror is in prime position to message friends as you put your make up on and even the amenities from bath soaps to flip flops and shaving kits, depict catchy social media slogans. Mulia Bali, a five-star hotel that exudes beach front luxury, is gearing up for the highly anticipated debut of Café Mambo on Wednesday 7 March. Café Mambo is a weekly party featuring beats and bikinis, and is styled after the legendary Café Mambo in Ibiza. This spectacular lifestyle event is all about creating summer holiday magic for in-house guests and resort visitors, and will be kicking off at 3pm every Wednesday. This iconic party event will be offering up sensational sounds by the resort’s lavish Courtyard Pool and have you surrounded by lush tropical gardens. See the press release attached for further information. 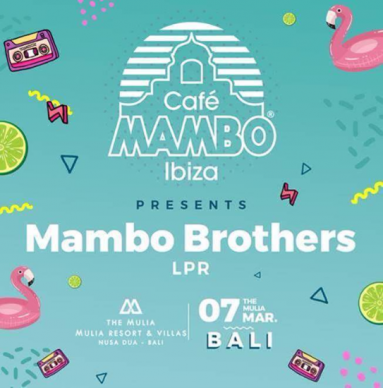 Café Mambo’s premiere event at Mulia Bali will feature the Mambo Brothers, who were raised in the clubbing utopia of Ibiza and are the sons of the Café Mambo Founders. Having commanded dance floors all around the globe, the pair will be bringing their dynamic DJing skills to Mulia Bali for a unique party experience. Berjaya Hotels and Resorts plans to launch chartered air services from Kuala Lumpur to Redang Island from June 2018 after purchasing two new aircraft. Berjaya Hotels and Resorts chief executive officer Hanley Chew said it would spend around US$15 million to US$20 million for the purchase of the two pre-owned turboprop planes. Chew said the two planes, which could sit up to 50 passengers, will have a 36-seat configuration instead and will fly from Subang Skypark Terminal direct to Redang Airport. The targeted clients who would be using Berjaya’s air service are holidaymakers who would stay at the Berjaya owned The Taaras Beach and Spa Resort. 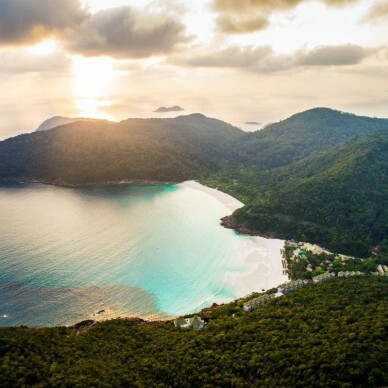 The charter package would include flights, accommodation and activities on the island, and starts from RM3500 to RM5000 per person for three days and two nights. In celebration of the 10th anniversary of the Epic Pass on March 18, 2018, Vail Resorts is honoring the epic service of the Company’s founders from the U.S. Army’s 10th Mountain Division, and the men and women of the U.S. Armed Forces, Canadian Armed Forces and Australian Defence Force with the introduction of a new $99 Military Epic Pass for active and retired military personnel and their dependents – an almost 90-percent discount to the regular Epic Pass price. Additionally, as the first of its kind in the mountain resort industry, all other U.S., Canadian and Australian veterans and their dependents are eligible for a $499 Military Epic Pass, which offers more than a 40-percent discount off the regular price ($269 for children under 18 years of age). Vail Resorts will donate $1 for every 2018-19 season pass sale to Wounded Warrior Project to benefit wounded veterans and their families, which would exceed $750,000 based on last year’s sales. What Aussies won big at Forbes Travel 2018 Star Awards? AccorHotels’ acquisition of Mantra Group is one step closer to completion. Meanwhile, we’re one step closer to Friday which is also cause for celebration. Mantra has released its half-yearly earnings. Looking at the results, we’re just wondering whether they’d like to fund our trip to Europe?